Luxottica - Rayban x Disney Digital Billboard Times Square from Adstasher on Vimeo. 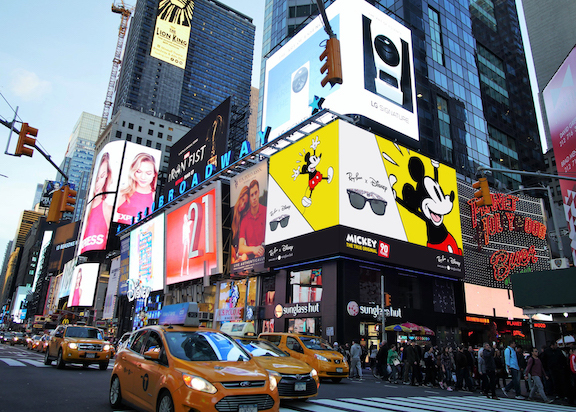 When the Walt Disney Company made plans to celebrate Mickey Mouse’s 90th birthday around the world, celebration campaign partner Sunglass Hut turned to leftchannel, the Columbus, Ohio-based motion graphics and animation studio, to create the experiential animation befitting such a milestone to be seen on the massive billboard outside their Times Square store. Disney and Sunglass Hut are collaborating on the launch of a new line of Disney-branded Ray-Ban Wayfarer sunglasses during Mickey’s non-agintennial celebration in New York City on Nov. 8, 2018. Leftchannel created the experiential animation that brings both the product — Ray-Ban sunglasses — and the Disney brand to life. Utilizing the Mickey Mouse graphic adorning the inside of the Wayfarer shades, sketched by Disney Master Artist Jeff Shelly. Leftchannel’s Ray-Ban + Disney celebration animation will continue to play at a variety of venues including the web and in stores for through out the holiday season and into 2019. Disney’s Mickey Mouse birthday celebration coincides with the launch of a three-month, immersive experience called “Mickey: The True Original Exhibition" in Chelsea that will run through Feb. 10, 2019. The exhibition will pay homage to Mickey Mouse’s influence on pop culture and art over the past 90 years. The Disney-branded Ray-Ban Wayfarer sunglasses will be available at Disney theme parks and Sunglass Huts beginning November 8, 2018.